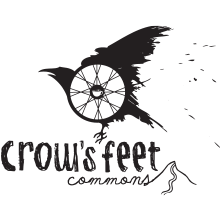 Crows Feet Commons is a product of Bend, Oregon area customers and the passions that drive their lives. Created as a welcoming hangout for fun-loving, community minded people who believe success is measured in laugh lines, Crows Feet Commons prides themselves on having an intimate, and at times punishing relationship with the products they carry. This expertise is shared to teach the nuances and benefits of every purchase, while customers are encouraged to simply Ride. Drink. Laugh. Free In-Store Pickup: If you’re looking for a secure place to ship your evo purchase, or need additional service, local knowledge, or just a place to go talk about your favorite activities, then we’re proud to partner with Crow's Feet Commons and know that they’ll take care of you when you visit. If you choose to pick up your order at Crow's Feet Commons, you'll receive an email when your order is ready for pick up. Orders will be held for 30 days unless additional time is requested. When picking up orders, please bring your order number, and a photo ID. Primary Categories Serviced: Alpine and A/T Skis, bikes, apparel and accessories.